Covalent molecules are bonded to other atoms by electron pairs. Being mutually negatively charged, the electron pairs repel the other electron pairs and attempt to move as far apart as possible in order to stabilize the molecule. This repulsion causes covalent molecules to have distinctive shapes, known as the molecule's molecular geometry. There are several different methods of determining molecular geometry. A scientific model, called the VSEPR (valence shell electron pair repulsion) model can be used to qualitatively predict the shapes of molecules. Within this model, the AXE method is used in determining molecular geometry by counting the numbers of electrons and bonds related to the center atom(s) of the molecule. The VSEPR model is by no means a perfect model of molecular shape! It is simply a system which explains the known shapes of molecular geometry as discovered by experiment. This can allow us to predict the geometry of similar molecules, making it a fairly useful model. Modern methods of quantitatively calculating the most stable (lowest energy) shapes of molecules can take several hours of supercomputer time, and is the domain of computational chemistry. The hybridization is determined by how many "things" are attached to the central atom. Those "things" can be other atoms or non-bonding pairs of electrons. The number of groups is how many atoms or electron pairs are bonded to the central atom. 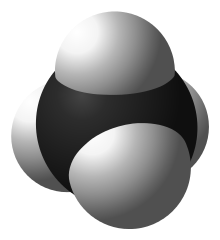 For example, methane (CH4) is tetrahedral-shaped because the carbon is attached to four hydrogens. Ammonia (NH3) is not trigonal planar, however. It is trigonal pyramidal because it is attached to four "things": the three hydrogens and a non-bonding pair of electrons (to fulfill nitrogen's octet). Consider a simple covalent molecule, methane (CH4). Four hydrogen atoms surround a carbon atom in three-dimensional space. Each CH bond consists of one pair of electrons, and these pairs try to move as far away from each other as possible (due to electrostatic repulsion). You might think this would lead to a flat shape, with each hydrogen atom 90° apart. However, in three dimensions, there is a more efficient arrangement of the hydrogen atoms. If each hydrogen atom is at a corner of a tetrahedron centered around the carbon atom, they are separated by about cos-1(-1/3) ≈ 109.5°—the maximum possible. To align four orbitals in this tetrahedral shape requires the reformation of one s and three p orbitals into an sp3 orbital. CH4 is a tetrahedral molecule. The VSEPR model treats lone electron pairs in a similar way to bonding electrons. In ammonia (NH3) for example, there are three hydrogen atoms and one lone pair of electrons surrounding the central nitrogen atom. Because there are four groups, ammonia has a tetrahedral shape but unlike methane, the angle between the hydrogen atoms is slightly smaller, 107.3°. This can be explained by theorizing that lone electron pairs take up more space physically than bonding pairs. This is a reasonable theory: in a bond, the electron pair is distributed over two atoms whereas a lone pair is only located on one. Because it is bigger, the lone pair forces the other electron pairs together. The lone pair occupies more space than a bonding pair, decreasing the angles. Testing this assumption with water provides further evidence. In water (H2O) there are two hydrogen atoms and two lone pairs, again making four groups in total. The electron pairs repel each other into a tetrahedral shape. The angle between the hydrogen atoms is 104.5°, which is what we expect from our model. The two lone pairs both push the bonds closer together, giving a smaller angle than in ammonia. In some molecules, there are less than four pairs of valence electrons. This occurs in electron deficient atoms such as boron and beryllium, which don't conform to the octet rule (they can have 6 and 4 valence electrons respectively). In boron trifluoride (BF3), there are only three electron pairs which repel each other to form a flat plane. Each fluorine atom is separated by cos-1(-1/2) = 120°. A different set of hybrid orbitals is formed in this molecule: the 2s and two 2p orbitals combine to form three sp2 hybrid orbitals. The remaining p orbital is empty and sits above and below the plane of the molecule. Beryllium, on the other hand, forms only two pairs of valence electrons. These repel each other at cos-1(-1) = 180°, forming a linear molecule. An example is beryllium chloride, which has two chlorine atoms situated on opposite sides of a beryllium atom. This time, one 2s and one 2p orbital combine to form two sp hybrid orbitals. The two remaining p orbitals sit above and to the side of the beryllium atom (they are empty). The non-bonding pair causes sp2 hybridization, leading to a bent shape. No non-bonding pairs causes sp hybridization, leading to a linear shape. Some elements will have a bent shape, others have a linear shape. Both are attached to two groups, so it depends on how many non-bonding pairs the central atom has. Take a look at sulfur dioxide (SO2) and carbon dioxide (CO2). Both have two oxygen atoms attached with double covalent bonds. Carbon dioxide is linear, and sulfur dioxide is bent. The difference is in their valence shells. Carbon has four valence electrons, sulfur has six. When they bond, carbon has no non-bonding pairs, but sulfur has one. Recall that some elements, especially sulfur and phosphorus, can bond with five or six groups. The hybridization is sp3d or sp3d2, with a trigonal bipyramidal or octahedral shape respectively. When there are non bonding pairs, other shape can arise (see the above chart). The yellow groups are non-bonding electron pairs. The white groups are bonded atoms, and the pink is the central atom. This is referred to as the AXE method; A is the central atom, X's are bonded atoms, and E's are non-bonding electron pairs. Molecules are not static; their bonds are continually twisting, stretching and bending. According to quantum theory, the energies of these bond movements are quantized, and this fact forms the basis of infrared spectroscopy, an important chemical tool in analyzing organic molecules.